Whether you want high-end wrought iron or rustic redwood, we will construct a beautiful and highly durable fence to elevate the look of any Torrance home or business. 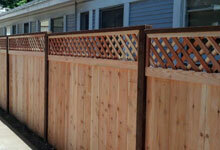 Unlike a general contractor, J&J Fence specializes in constructing fences. We understand how to fabricate a fence with a variety of materials, select the most durable hardware to fit a specified budget and work on any landscape. Additionally, everyone on our team has more than a decade of experience (the average is 15 years) and ownership closely supervises every project. We are family owned and operated; and licensed, bonded and insured. We are also proud to say that we never use subcontractors. 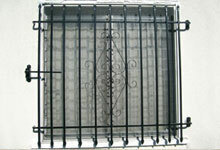 Any of our fences, railings and window bars can be as ornate or as simple as you want them to be. We have 1,000s of pictures and designs to inspire your vision, or can work with your sketches. We can even look at your home or business and suggest some ideas based upon an initial consultation. The options are endless--from materials to toppers and caps to decorative additions, like medallions and scrolls--but we'll make the design process manageable for you. By considering your specified budget and concept, we will help you achieve your dream fence. In our 30 years of service to Torrance, we have become known as a reputable fence contractor that residents can rely on for high quality iron, steel, aluminum, vinyl, wood and cinder block fences and gates. Plus, our service is unbeatable and our prices are very reasonable. Call today to schedule an appointment. Get the most out of your fence investment with our highly experienced, professional fence installation services available to all of Torrance. We install everything from decorative fencing to single and bi-parting folding gates to high security chain link. We are also experienced in all the major brands of gate operator and access control systems and can have your gate fully functional upon the project's completion. 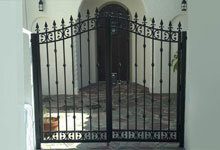 Is it time to fix, replace or upgrade that broken gate, drooping chain link or weatherworn fence in Torrance? Call J&J Fence. We will help you consider your options. We are experts in custom fencing and can repair a fence section or gate so that it matches the rest of the fence perfectly, or replace just a portion of the fence. Let us know what your goals and budget are, and we will help you achieve them. Contact us today for your free consultation and price quote in Torrance. We would be more than glad to assist you in planning your project, selecting your materials and finalizing your design. 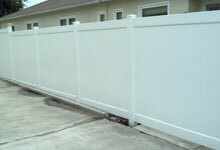 We will help you get a fence that is customized to your personal requirements and preferences. For inspiration, you can look at our gallery for samples of our work or call us directly and learn about our long lasting, high quality range of work and competitive pricing. New customers enjoy a 10% discount!